Make up to a 100 projects! Four colorful, tropical-themed projects for persons with severe to moderate degrees of cognitive impairment. Necklaces require simple repeated actions of placing beads on elastic cord; awareness of color sequence is optional. Key Rings require learning new short-action sequences, while attending to number, color and position of beads. 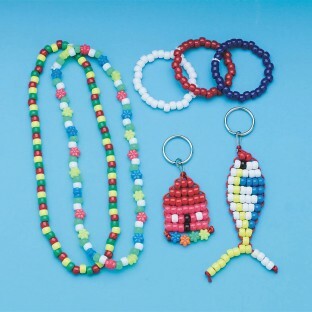 Includes elastic cord, key rings, lanyard hooks, plastic beads, rattail cord and diagrams of designs to make 100 projects.